Topo Athletic has distinguished itself by occupying the sensible middle ground that combines minimalist construction philosophy with structural features for comfort, protection and performance. Their shoes tend to occupy the lower and lighter weight end of the spectrum, but a new model this fall offers a high-cushioned option to their growing trail line. The Topo Ultraventure launched October 1 exclusively at REI and will be available everywhere in November. We were sent an advance pair this summer, and put them to the gold standard for trail shoe testing: a mountain 100-miler, specifically the Run Rabbit Run in Steamboat Springs. Upon our return from Steamboat, we had another new Topo model waiting for us: the Terraventure 2, which will launch publicly in November. We’ve been using them for our recovery mileage, with enough hard efforts thrown in to get a feel for how they perform. 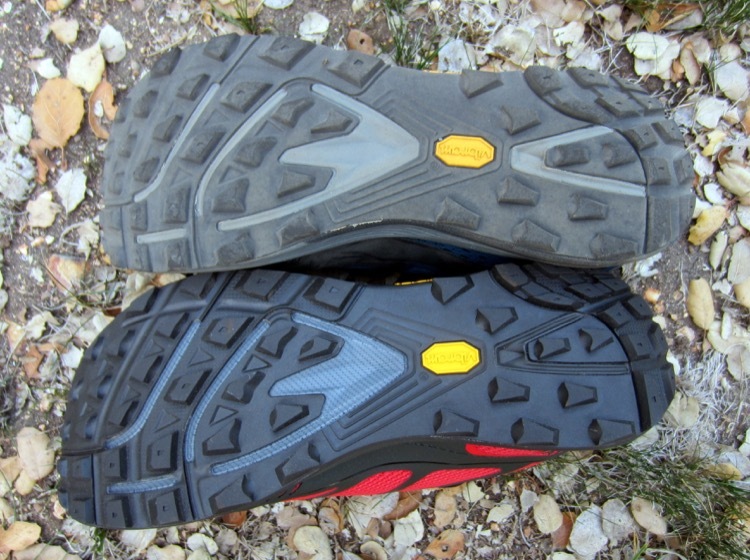 Many of the features on these two shoes are identical, with key differences being stack heights, midsole EVA, and presence or absence of a rock plate. The intention of the Ultraventure is fairly clear: Topo lacked a high-cushioned model to complement its lower profile trail runners and developed the Ultraventure based on feedback from its team of customers and ambassadors. 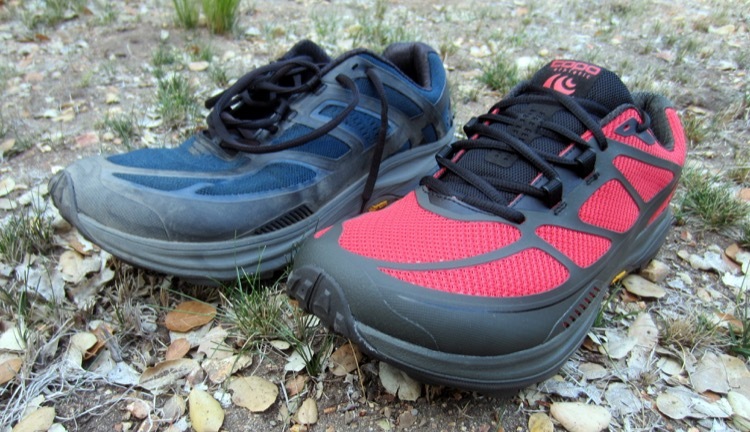 It’s the most substantial trail shoe in Topo’s lineup, and consequently also its heaviest. Fit of these shoes is exactly what you’d expect from Topo: snug in the heel, streamlined in the midfoot, with a nice roomy toe box to let your forefoot splay naturally. 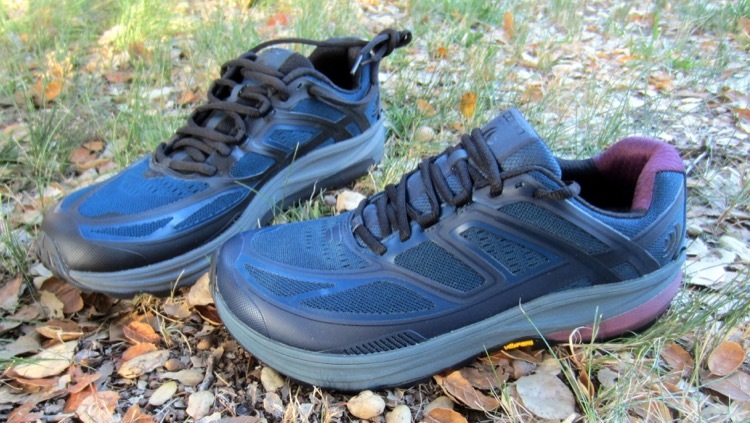 The uppers have numerous synthetic overlays, but enough open mesh to provide nice breathability in hot conditions. Open drainage gills on either side of the metatarsal heads allow water to escape easily for quicker drying. A wide toe bumper in front wraps around the sides for strong resistance to stubbing or abrasions. The midsole construction is another uncharted area of sorts for Topo, as it’s their only trail running model to feature a 5mm heel-toe drop. Historically Topo trail shoes have had drops of 2 or 3mm, which is just enough to give you some margin for error with form on downhills, but doesn’t accommodate the increased tendency to heel strike with high miles or steep terrain. The tradeoff is that if you’re a true midfoot striker, you’ll encounter some difficulty holding form on flat terrain. We’ve found the EVA construction to provide excellent comfort on impact as well as very smooth transition from rearfoot to forefoot. 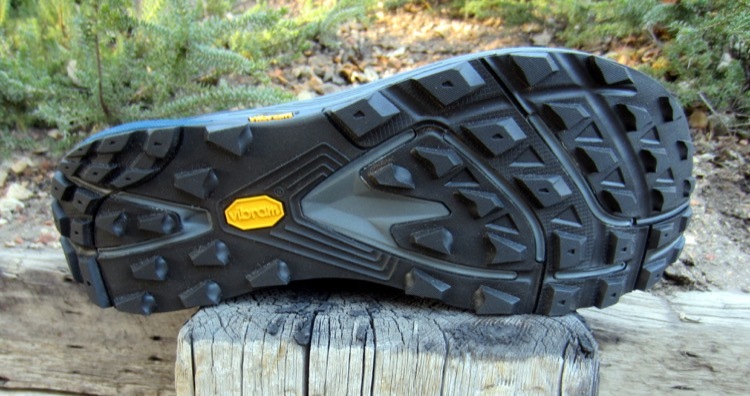 A key strength of the Ultraventure is its Vibram XS Trek outsole. The rubber compound has excellent grip on wet and dry surfaces, and the aggressive 4mm lugs hold firm on muddy trails or loose gravel while maintaining a great amount of flexibility to allow natural foot movement. The compound also appears to be rather durable, showing little signs of wearing down after 100 miles in the Rockies. The same can be said for the entire shoe, which proved to be both rugged and comfortable enough to carry us through the long haul. 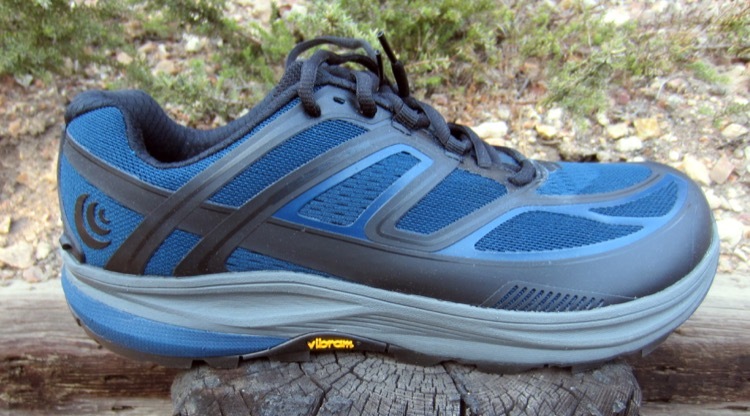 Fit of the Terraventure 2 stays consistent with all Topo models, and the upper has a similarly wide overlay bumper in the front of the toe box that wraps around the midfoot, just as on the Ultraventure. The synthetic overlays connecting upper to midsole are thinner on the Terraventure 2, which allows better overall breathability. The key change to the Terraventure 2 is the new outsole, which is every bit as exceptional as the Ultraventure – because it’s exactly the same. 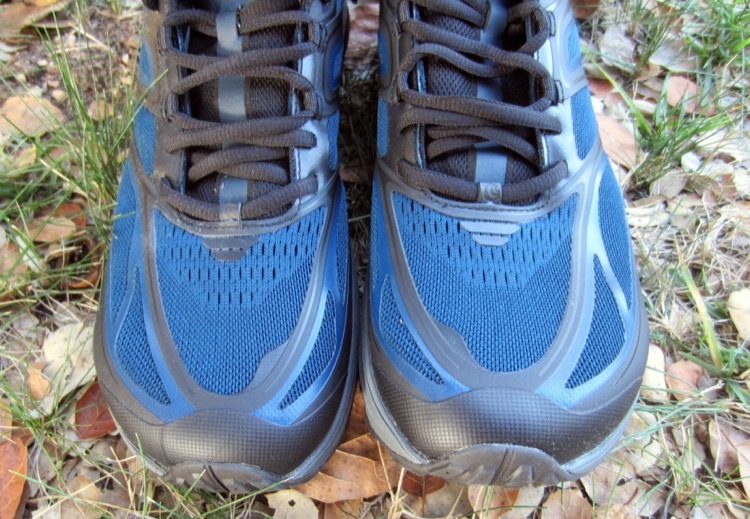 Both the stack heights and heel-toe drop of the Terraventure 2 are lower than the Ultraventure, so this model is recommended for those who habitually have a more natural running form. One important distinction to note is that the Terraventure 2 has a forefoot rock plate, so even though you’re closer to the ground, your feet are still fairly well protected from impact, especially if you land on your midfoot. In our initial testing, the Terraventure 2 feels like a nimble trail runner with strong protective features that is well suited for a variety of conditions. The Topo Athletic Ultraventure is available now at www.rei.com. 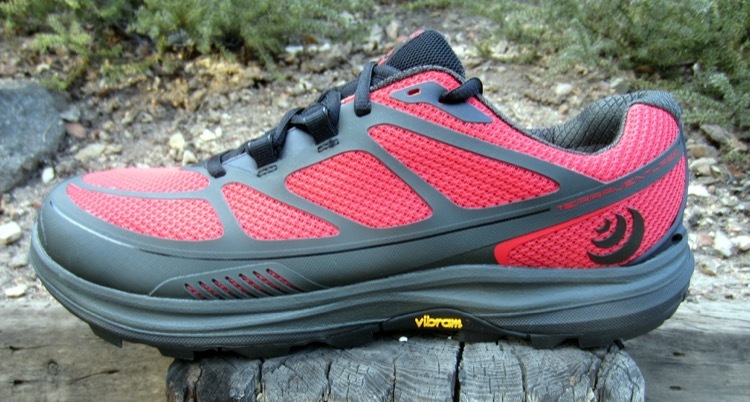 Starting in November, both the Ultraventure and Terraventure 2 will be available at www.topoathletic.com. Thanks for the insights. How did the actual 100 go? Did you wear the Ultraventure pair for the entire race? Did you treat your feet at all and what socks did you wear for the race? Would you still recommend this shoe for other 100s? Looking for the combo hoka cushion, altra splay but 5mm drop or more. Could this be the shoe? Hey Skrapple. Sounds like the Ultraventure is just what you’re looking for – excellent cushion, 5mm drop and loads of room up front for toe splay. They pair really well with Injinji socks. I wore them in a recent 50km and plan on wearing the Ultraventure at the Rocky Raccoon 100 in February.